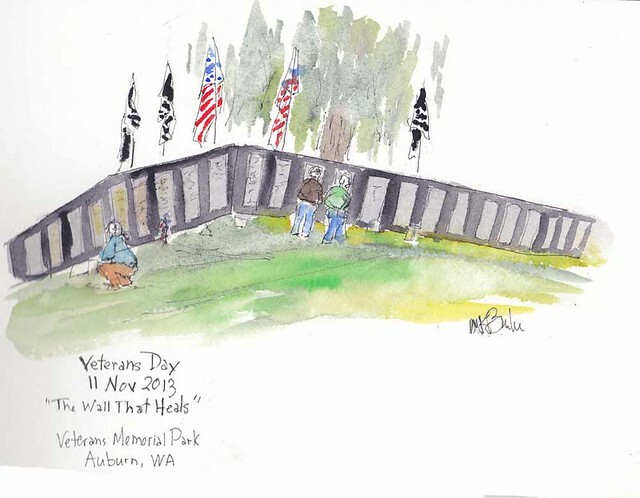 Since I've returned to sketching, I've made it my practice to sketch on Veterans Day as a meditation and a commemoration. Last year I went to the National Cemetery. Today I went to see the Traveling Wall. It was impressive. It is the entire Wall but half size. It's also not carved stone but metal. It is in Auburn for the commemoration. I sat in the temporary bleachers under a tent to sketch the wide view. Then I wanted to do a detail of some of the items left at the wall, as is done in DC. A few people came up to me and we had some nice conversations. It was a rather emotional experience as one of the veterans was very appreciative of my effort to commemorate the Wall with a sketch.